Forcibly returned from Manchuria, these Japanese at Sasebo Relocation Center are awaiting transport to other camps or a place with friends or relatives. Between October 1, 1945 and December 31, 1946, 5.1 million Japanese, civilians and soldiers, returned from Manchuria, China, Formosa, the Pacific, Okinawa and Asia. Another 1.1 million returned in 1947. 676 Japanese decided to return from the United States, either because they rejected their US citizenship after internment or because they were Japanese citizens. To accomplish this, the remnants of Japan's shattered fleet and liberty ships and LSTs operated by 100,000 US Navy personnel were used to transport them home. Many were processed in Sasebo, a camp operated by the US Army. The returnees would carry the ashes of the dead from overseas or who died along the way in small white boxes. 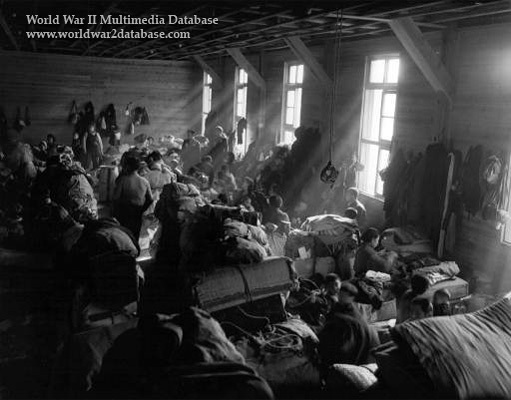 If they did not have a place to go, they were housed in camps like Uraga Relocation Center in Tokyo Bay. Food, clothing and medicine were scarce, and death from starvation or dysentery was frequent. Since many of the repatriated Japanese had lived outside of Japan their whole lives, reintegration into Japanese society was difficult. Often they were treated as foreigners and denied housing, education and employment. Sasebo now has a monument to the 6.2 million repatriates.